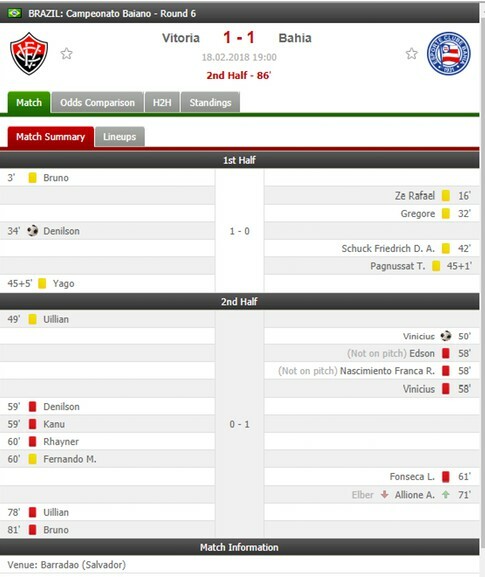 Absolute mayhem in the Brazilian top flight clash between Vitoria and Bahia which saw the game being abandoned after 9 (yes NINE) red cards were issued during the fixture. Vitoria lead 1-0 at half time, Bahia levelled scores with a penalty and their celebrations after scoring lead to a fight, which saw Kanu land a punch on penalty goal scorer Vincius. The ref sent off three Vitoria players and four Bahia players (including two from the bench that were not on the field). Vitoria were thus down to eight, while Bahia had nine players on the field. Following this, two more Vitoria players got themselves sent off, leading them to go to six players- below the seven minimum required to continue a game, which lead to it being called off.